Boatbuilding is preceded by a discussion between a boat owner and a boatbuilder. Boat owner has to decide on a type and purpose of his desired boat, maritime area in which the boat will be used, its dimensions, drive and specify all the details the boat will be fitted with. Taking into account all the set parameters, boatbuilder begins with the preparation of drawings. After an agreement is reached, the boatbuilder commences with boat design. First, he draws bow stem and stern frame (colloquially, ašta), and after that a midship section (šest). The boat can have from one to three sections of the same dimensions. Šest or midship section model is made of sturdy material (mostly plywood). Then he makes a deck line and main water lines. After deck line, he draws a draft line and determines a number of sections and distance between them, depending on the boat length. The sections are marked on a keel. 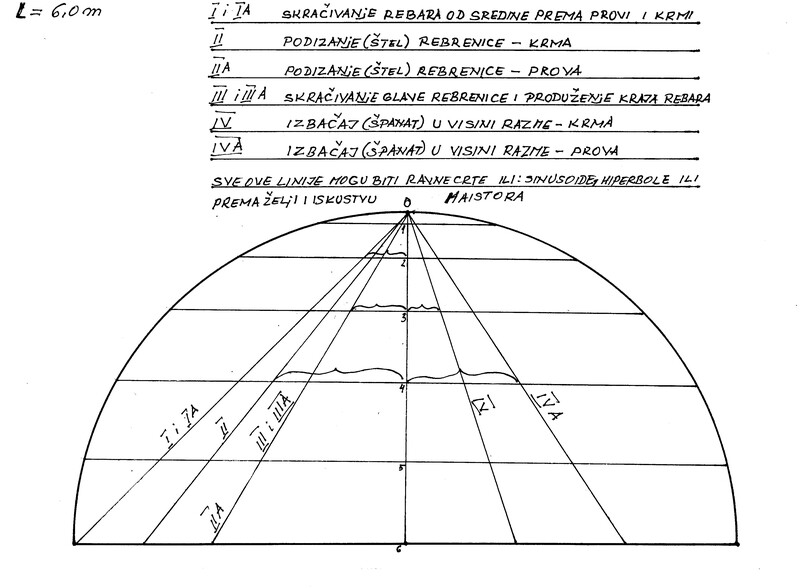 Semi-diameter of buška is determined depending on the boat’s length. One quarter of sections towards the stern and one quarter of sections towards the bow are drawn by aid of buška, without taking into account midship section or sections (1-3). The first quadrant of buška is divided into the number of parts representing a one quarter of sections. Tapering of sections towards bow and stern and inclination (štel) of floors and bulwark rail sections bevel (španat) are specified. 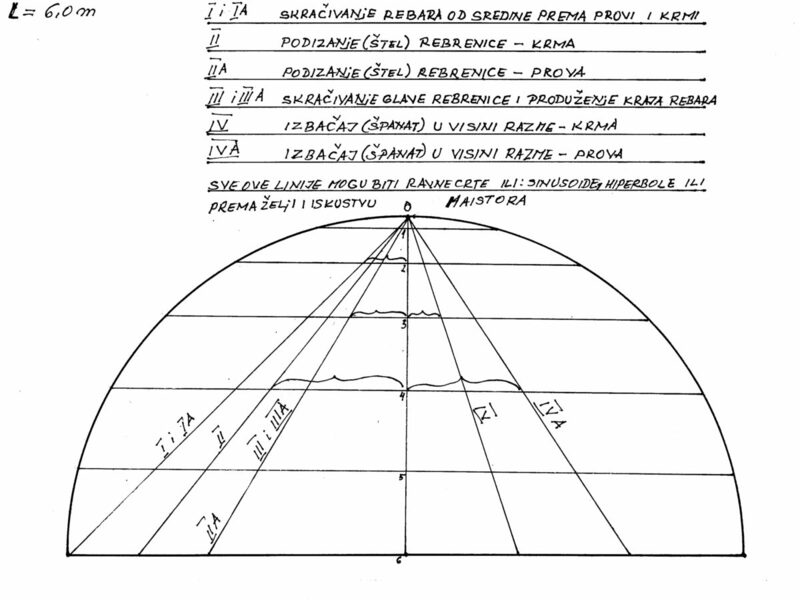 These quantities are then converted to a panel made of strong wood with following dimensions: its length equals two semi-diameters of buška, and its width equals half of keel’s width. The boat is drawn by šest and a panel. One quarter of sections towards the stern and one quarter of sections towards the bow are drawn. 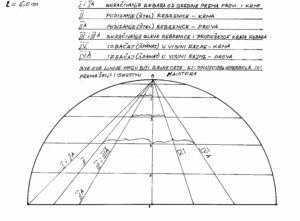 Every master makes drawings of the remaining sections to bow stem and stern frame (aštas), according to his own experience and secrets of the craft. This method is used for drawing different boats from five to 20 meters of length. When buška is made, its variables could be used for 20% longer or shorter boats. Design of boat form by preparation of half-scale model is made to a scale of 1:10. Half of model is enough to define the form because of the boat symmetry. Arrangement of small boards is worked on until a desired boat form is achieved. The board thickness corresponds to distance between the water lines. Planing of the boards is carried out in a way that outside dimensions correspond to boat size on a true scale. The boards are connected by hardwood wedges keeping them at the same position. The boat form is shaped arbitrarily, in accordance with the vision, knowledge and experience of the boatbuilder. The finished model is dismantled by taking out the wedges, and traces of water lines are copied to a drawing from each board. Mutual position of boards is determined by location of wedges.